Remember when Big Data was a problem? Though its origins are somewhat murky, the phrase “Big Data” gained mainstream popularity as shorthand for a set of problems unique to extracting value from massive, complex data sets. Once an ecosystem of tools, research and best practices emerged to manage and make sense of this kind of data, the phrase gradually flipped from negative to positive in connotation. What’s happening right now in the visual content space is eerily similar to what happened with Big Data. Marketers are facing two—seemingly contradictory—problems. Problem 1: Not enough visual content. When marketers decided they wanted to be data-driven, a lot of them found that the data they had access to came up short. It didn’t tell them what they wanted to know, there wasn’t enough of it, or it was fragmented, locked away, or formatted in too many ways to reconcile easily. They wanted more good data, and they still do. Brands are spending an astounding amount of time, money and effort to cross the canyon, but it’s futile: consumers will always want more content than companies can produce. 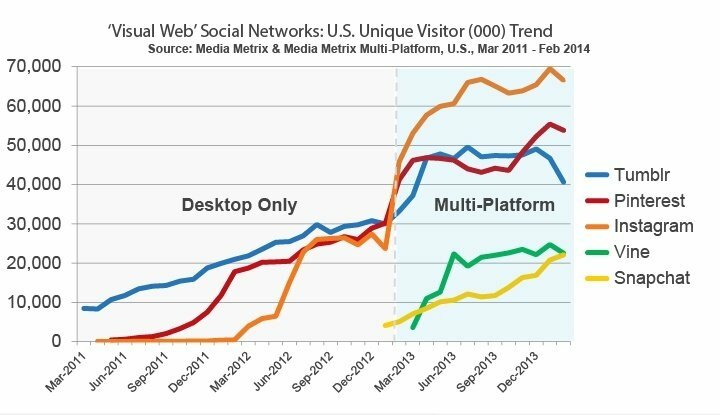 This chart from Comscore shows the demand growth nicely. In June of 2013, Instagram users liked 1B photos per day. 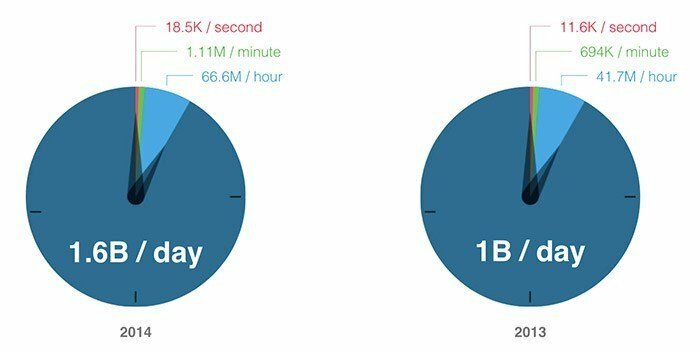 Now they’re up to 1.6B per day: 67M per hour, 1M a minute, 19K a second. 63% of consumers tell us that they trust consumer photos more than brand or retailer photos, and 54% of them have put away their wallets or postponed a purchase because of unhelpful product photos. B2C marketers are experiencing difficulties with content creation, visual and otherwise. They can’t find enough time (57%) or budget (48%). They struggle to measure its effectiveness (36%), and to produce enough of it (51%). These are just some of the problems that carve that visual content canyon deeper and deeper, falling further behind consumer demand. Problem 2: Too much visual content. Returning to Big Data for a moment. Once companies were able to solve the scarcity problem (not enough data) by building and buying technologies to gather, store and process it, some now had the opposite problem: The data they encountered was too big and too unstructured to derive much value from. Nearly one trillion photos will be taken in 2014 alone, equal to a quarter of all the photos snapped in the first 170 years of photography’s existence. In 2013, visual content creation crossed over from a trend to the norm: That’s when we saw, for the first time, a majority of internet users, 54%, say they have posted original photos or video. That’s up from 46% just the year before. But what about branded visual content? That, after all, is what brands need in order to cross the visual content canyon. It turns out consumers are creating and sharing far more branded photos on Instagram than the very brands they’re tagging in those photos. For example, for every photo posted by a Top 10 fashion brand (ranked by number of followers), more than 5,000 photos are posted by consumers with that brand’s hashtag, on average. Sorting through 5,000 customer photos to locate those that are “on brand” and likely to yield business value isn’t anyone’s idea of a good time. If this was the only way to access the value in organic visuals, volume would arguably be just as bad as scarcity—just like it was in the days before Big Data was seen as a real asset. The history of Big Data tells us that with the right strategies and tools, bigger is better. An ecosystem is still being built around that idea. A parallel ecosystem is forming right now around the idea that the abundance of organic visual content is a boon for businesses of every stripe. More content means more opportunities to find the best of what consumers are creating, no matter what your brand is looking for. For example, Olapic built Photorank™, an algorithm tool that uses more than 45 contextual factors to rank photos by their predicted conversion power. Sorting these photos like this makes it far easier for brands to focus on the photos that will drive results. Another company, Ditto Labs, surfaces branded photos based on visual clues (e.g., logos), and provides insights about things like geography, use cases, commonly paired products and demographics of the people taking the photos. And TOTEMS is an Instagram-focused platform that combines a useful array of analytics with influencer discovery and outreach. These are just a few of the companies creating the new visual content ecosystem. Bigger players like Yahoo!/Tumblr and Google are getting into the space via strategic partnerships and acquisitions. Strategies, benchmarks, and best practices are being developed and optimized. As a result, more and more brands are crossing the visual content canyon and heartily embracing—not fearing—the unstoppable acceleration of organic visual content creation.